You just purchased one of our best WordPress themes and we hope that you will enjoy with this purchase! If you like our theme can you please kindly leave positive 5 stars rating review for our theme on Themeforest? ( check how to do this http://magniumthemes.com/how-to-rate-items-on-themeforest/ ). This is very important for us! Please do not leave negative review if you have any problems, just let us know and I will help you to fix this. You can get FREE WordPress and Theme Installation service for this theme, check here how to apply. If you want to have additional theme features that theme does not have by default or want to change theme styles you can always order our theme customization services, check services and prices here. We recommend you to use Bluehost hosting to host your sites based on our themes. Bluehost users eligable for our FREE theme installation service offer. Most popular hosting panel cPanel – for FREE! SSH access for your sites – for FREE! Unlimited bandwidth for your sites – for FREE! Live Chat 24/7 support – for FREE! Popular scripts installation with one click – Magento, OpenCart, WordPress and 50+ more scripts! The most important and great thing that with Bluehost you can install your OpenCart, WordPress or Magento website in just 5 minutes and 1-2 clicks! That allow you to not spend money for installation services and install different scripts yourself automaticaly, without any software knowledge! This is why we can recommend Bluehost for all our customers again. If you don't want to install theme yourself you can always order our WordPress and Theme installation service. FTP upload: Using your FTP program, upload the non-zipped thebuilt folder into the /wp-content/themes/ folder on your server. 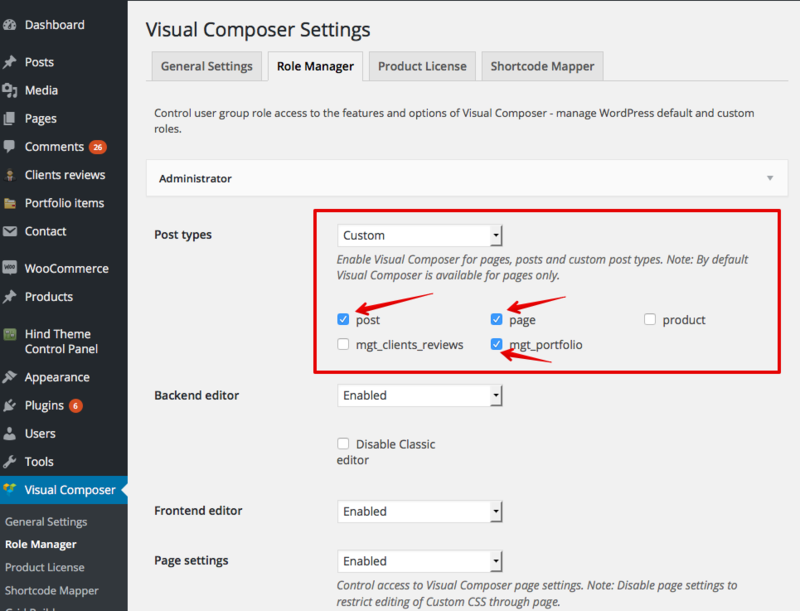 WordPress upload: Navigate to Appearance > Install Themes > Upload. Go to browse, and select the zipped thebuilt.zip file. Hit Install Now and the theme will be uploaded and installed. Once the theme is uploaded, you need to activate it. Go to Appearance > Themes and activate TheBuilt theme. Check that cache subdirectory in theme folder available for server writing (chmod 0777 or other permissions rules for write on your server). After the install finish, go to TheBuilt Control Panel page, then click Save button import default settings values to database. You don't need to do this if you use 1-Click Demo import feature. After you Activate this theme you will see message in WP admin panel that you must install required plugins and can install recommended plugins. Don't worry - all plugins included with theme and you don't need to download or purchase something. TheBuilt theme has included 1-click demo data import feature. This sample data contains menus, sample pages, posts and images. Your site will looks exactly as our demo site if you import sample demo data. We are strongly recommend you to import Dummy Data first time when you use our theme first time. 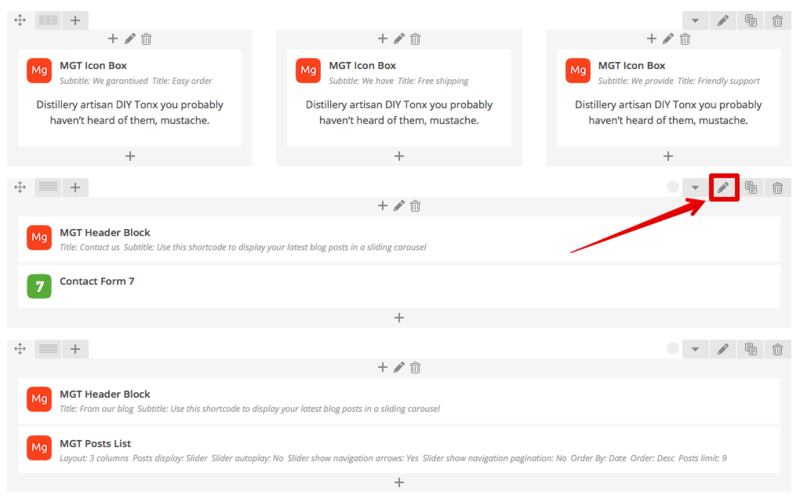 You can import all theme demo content with one click (posts, pages, products, categories, menus, sample images, sliders, plugins configurations). Check this article how to solve demo data import problems. Please note that theme data does not have real images from our demo, all demo images will be replaced with sample solid blue color background images (you don't have legal rights to use real images, because you don't purchased it). You need to change demo images to your own real images. If you don't imported dummy data you must create theme pages and menus manualy. Use this only if you can't import demo data correctly with 1-Click demo data import for some reason. Go to Tools > Import > Wordpress. 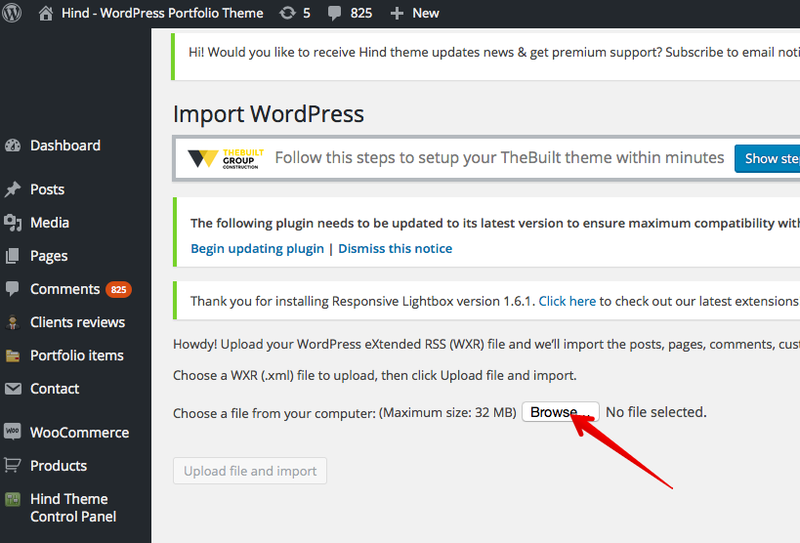 If you don't installed WP Importer plugin before you will be asked to install it. Select content.xml demo file from /inc/oneclick-demo-import/demo-files/1/ theme folder. Submit Upload file and import. Assign posts author to an exitsting user account. You can check to Download and import file attachments checkbox to import all sample images. Please not that this option require good server with a lot of server memory and CPU available. If you have cheap shared hosting don't check this option. Importing all images will take 10 minutes or more (WordPress will download & generate around 30 MB of test images), depending on your server hardware. We recommend you to import sample images on local test servers without low memory/time limitation on your PC/Mac (We recommend to use MAMP). You need to set large values for PHP time limit (1 hour or more) and PHP memory limit (256MB or more) in php.ini configuration file on your server before you start importing images. 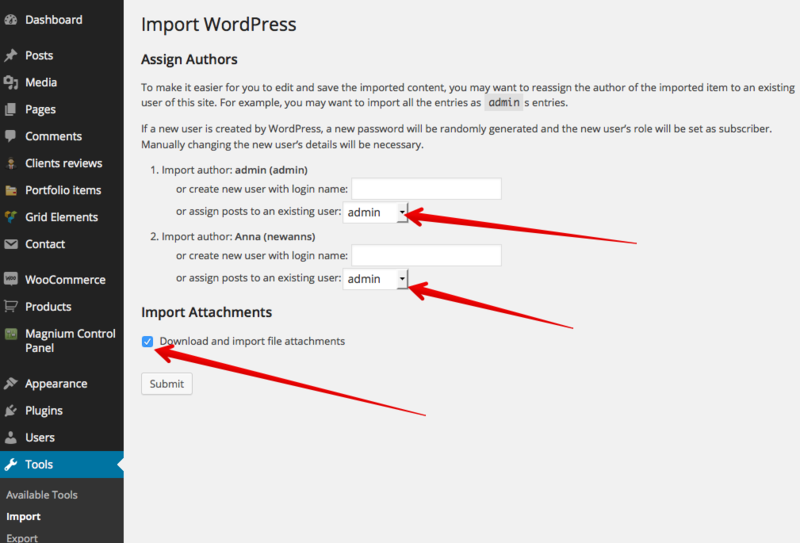 Submit and wait when WP tools download data and attachments to your WordPress site. If you don't see Success message after import or your page just stop loading with or without any error, and your site does not look like our demo this mean your server configuration does not have enougth scripts time limit and memory limit to import all sample data. You should contact your hosting/server provider and ask to increase PHP memory limit and time limits. 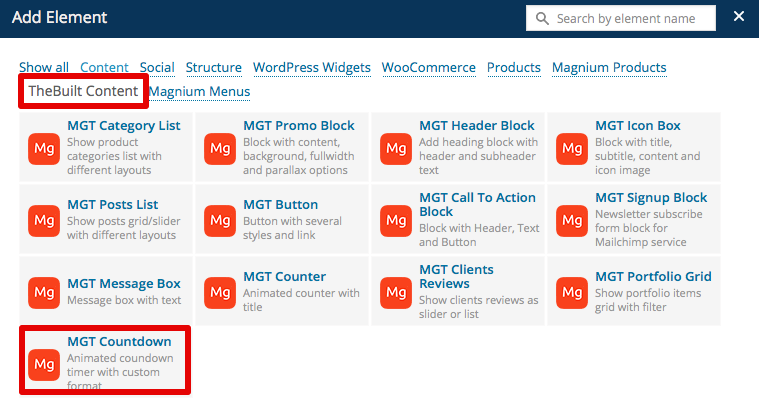 Go to Appearance > Widgets and delete all default WordPress widgets from all theme sidebars. Install and activate Widget Importer & Exporter plugin. Click Browse... button and select /inc/oneclick-demo-import/demo-files/1/widgets.json file from theme folder. Now you can go to Appearance > Widgets and reconfigure sample widgets in all sidebars to your purposes. Revolution slider is very powerful slider with different animations, effects and more, you can read about this slider on its official website. Please note: We do not develop Revolution slider and don't provide any support about usage, setup or configuration of this slider plugin. You can get Slider support at ThemePunch support website. Click Browse and select some slider ZIP file from /inc/oneclick-demo-import/demo-files/1/revslider/ from theme directory. 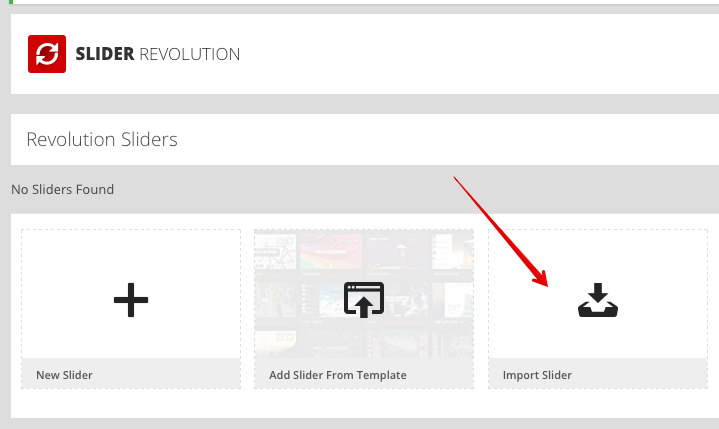 You will see Imported Slider in your sliders list and now you can use it anywhere in theme (just use Revolution Slider element from our Visual Page Builder elements list when you want to insert slider to page, post or product). You can import all other demo sliders from folder by the same way. To add your logo to theme follow steps below. Go to Appearance > Header or Appearance > Customize. If you want to show Retina logo (high resolution logo for retina devices like iPhone, iPad, MacBook Retina, etc) you need to prepare your logo 2x size larger that original. For example if you want to see logo with 200px width on your site you should make your logo 400px width. Click Add new image and Select your logo image and click Save. Upload light version of your logo (white) as "Logo for Transparent Header", it will be used with transparent header. Image should be the same size and dimensions as your regular logo. You can crop logo image if you want. If you have big logo you can adjust Header height value too. 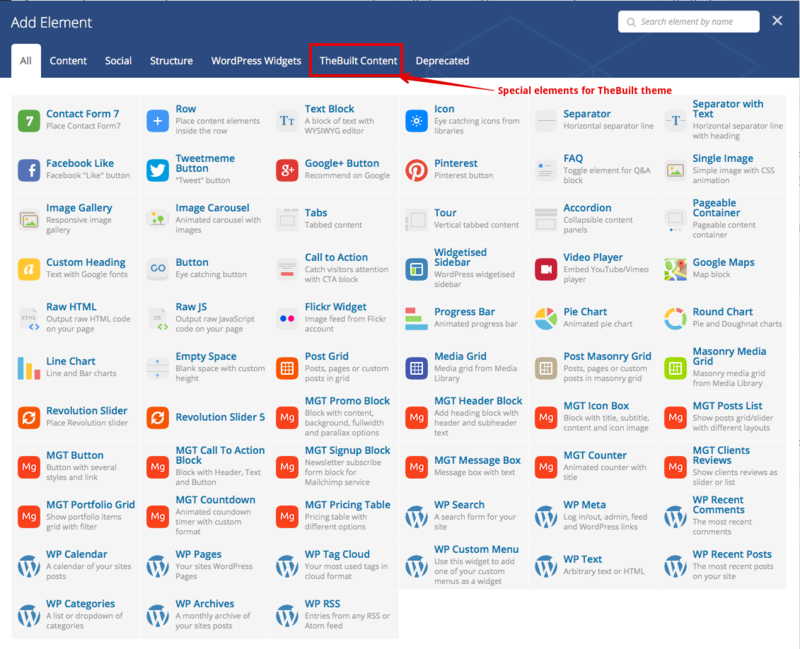 WordPress has evolved into a fully functional CMS. Page Builder completes the transition by giving you a way to create responsive column layouts using the widgets you know and love. This themes comes with Visual Page Builder with a lot of page builder items and our special MGT items created especialy for this theme, you will have the flexible to display your content to the page. Our Visual Page Builder allow you to edit pages directly on frontend! 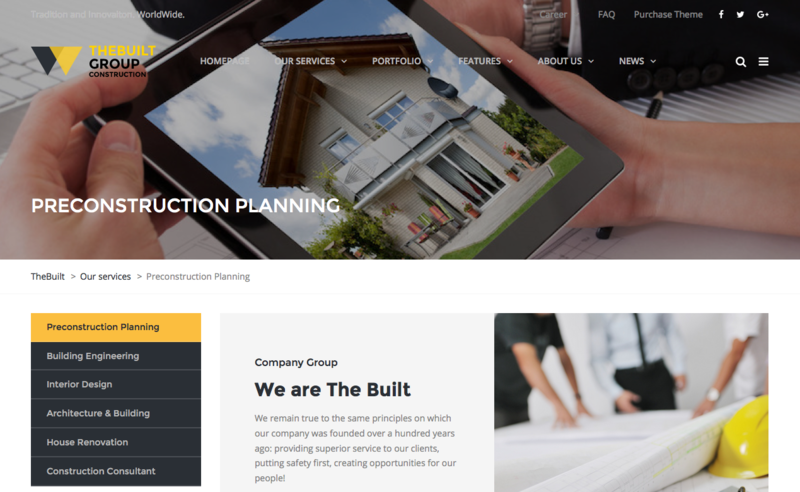 All demo site pages was created in Page Builder provided with theme. Please refer to page builder video tutorials and import sample data to understand how it works. Visual page builder have a lot of features, we recommend you to read full Page Builder Documentation guide here. 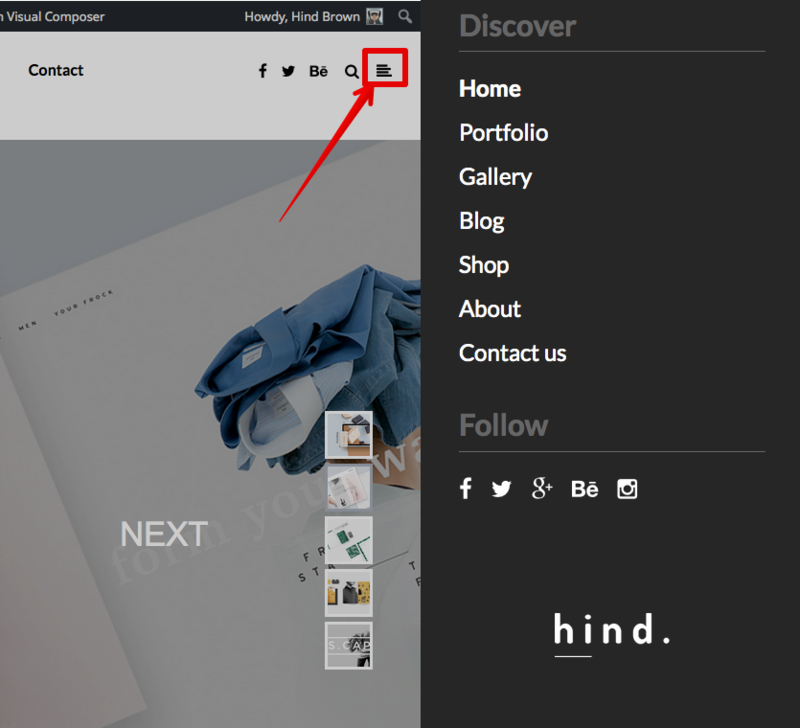 or click Frontend editor to edit your page directly on your frontend! You can read about special theme elements in current documentation. You will see that element was added to your visual content editor. You can move, edit or delete them. For any questions about Page Builder you can use WP Bakery support forums. We don't develop Page Builder plugin and does not provide any support about it usage. You don't need to create Homepage and Blog pages if you used 1-Click Demo Data import feature or imported theme demo content manualy. Check Don't display this page title option, because we don't need to see Homepage title. Now you can create content of your HomePage. You can skip this step and read next documentation section "menu management" if you imported sample data, because you already will have demo homepage as on our demo site. 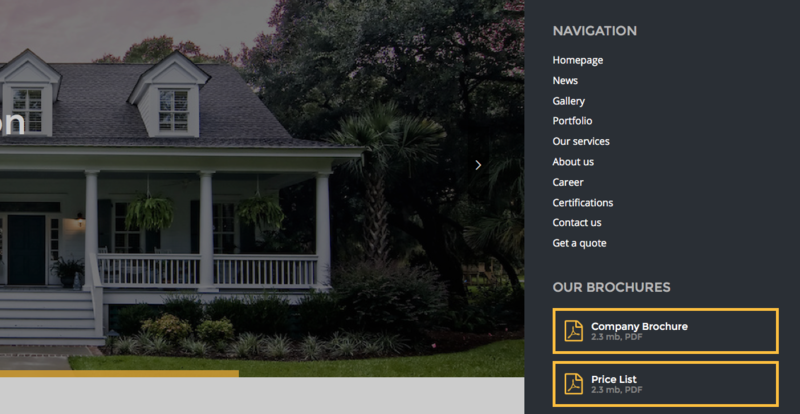 You can add different blocks for homepage with our predefined styles to made your homepage looks similar to our demo site or create homepage as you want in our Visual Page Builder (all content on our demo site created with it). We strongly recommend you to import demo content first time when you use our theme to check all theme features and all Page Builder elements and understand how it works. If you don't imported demo data you will need to add Page Builder elements to your homepage yourself. 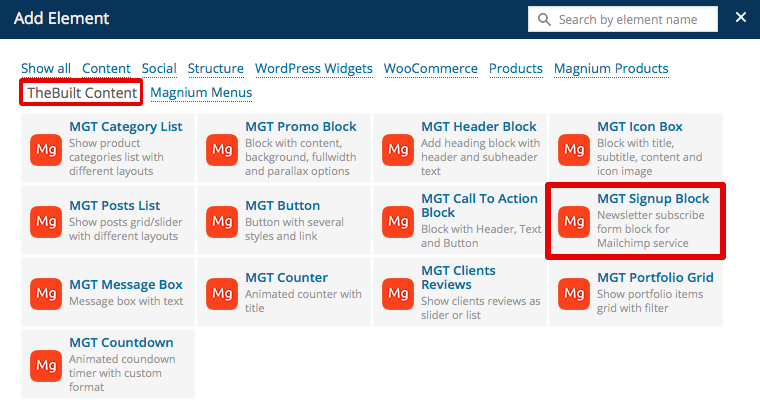 You can use Page Builder elements and our special theme Page Builder elements (Magnium groups in Page Builder elements groups). You can read about our special elements in current documentation here. 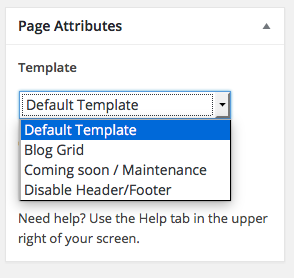 You can read about Default Page builder elements usage in Page Builder documentation here. Input some page title. Page title will be show on Onepage template before page content. You can Input page class if you want to add some CSS styles only for this page. Stick page content to footer - Enable if you want to have last page element sticked to footer without margins. Show transparent header - Use this if you have fullwidth image or slider at the page start (header will be displayed above your image). Page sidebar position - you can specify widgets sidebar position for this current page (every page can have different settings here). Page title background image and color - you can specify page title background image and color here. Go to Appearance > Menus and add created page to menu. You created blog page before (in Installation step) and added it to your post display page in Reading settings. 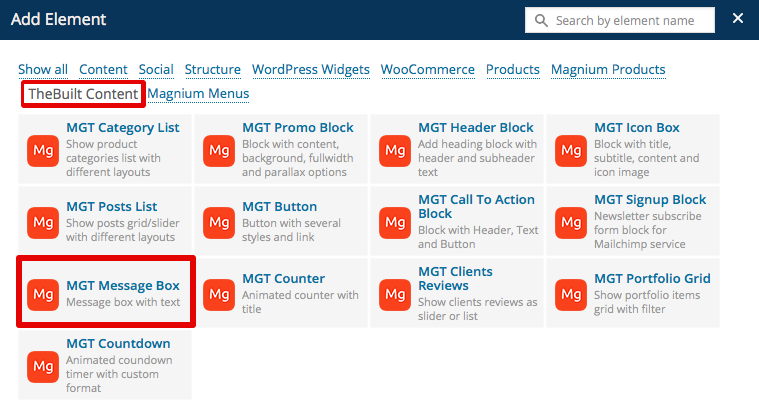 If you added Blog page to menu it will displayed in site menu and will open blog page with posts. 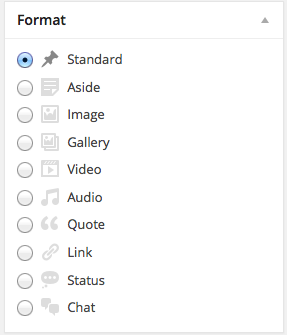 You can manage blog posts and categories as in any WordPress theme. You can use post thumbnails too. You can select post format when you create post. You can select different sidebar position for posts in Post settings. Our theme have built in Coming soon/Maintenance mode feature, that allow you temporaly disable website frontend for regular visitors (they will see your custom Coming soon page), but allow website administrators to see site and work on it. You can see coming soon page demo here. Go to Pages > Add New and create new page Coming soon (you can use any name). Add some page content using Visual Page Builder that you want to show to your users (Countdown timer page builder element is very useful here). Note: You should have only one page with Coming Soon Template selected. 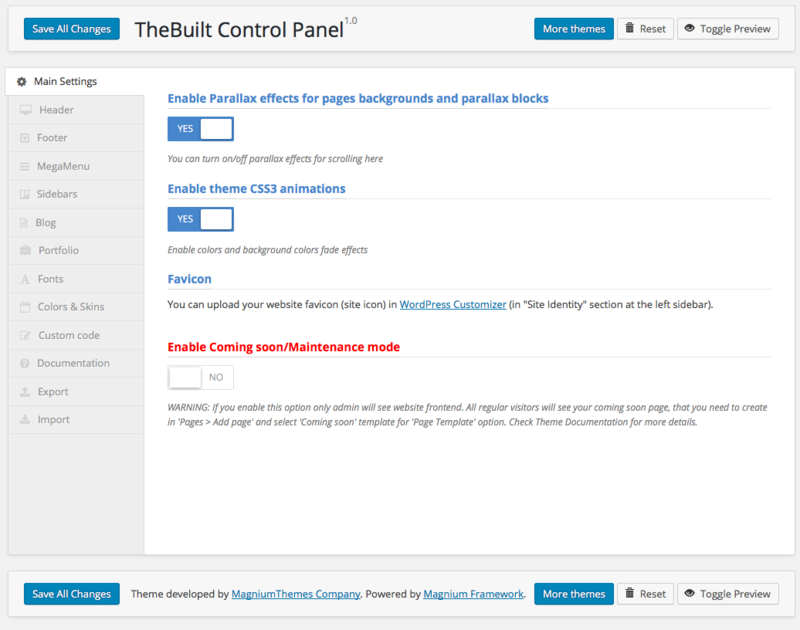 To Enable coming soon mode go to Appearance > Theme Control Panel > Main Settings and check Enable Coming Soon mode. Now your regular users will see your page. Don't forget to disable this option when you will go live. This theme have top menu, main menu, footer menu and offcanvase wigets sidebar that can be used as additional menu. Main menu can have different layouts and support MegaMenu features. 2. Main menu (several variations depending on theme settings). You can change MainMenu settings in Appearance > Theme Control Panel > Header. Select menu "Main Menu" for Main menu, "Top Menu" for Top Menu and "Footer Menu" for Footer Menu. If you don't have some menus you need to create it first and add your elements. You can use special predefined CSS class names for main manu items to change its look. pull-right - use this to move your element to right side of main menu. mgt-animated - use this to add hover animation for menu element. mgt-highlight - use this to add theme color background to this menu element. This is special sidebar where you can add any menus, widgets or any other content in additional to your regular menus. 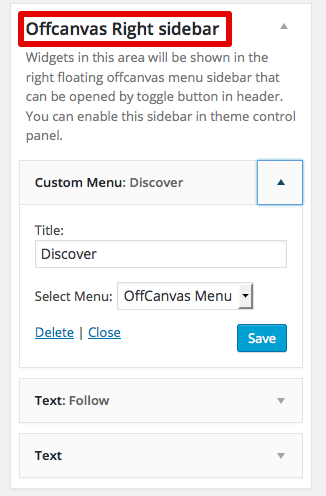 Go to Appearance > Theme Control Panel > Header and enable Enable right side offcanvas floating sidebar menu option. We developed our own Mega Menu functionality especially for this theme. This is awesome responsive meage menu. Features: icons, sticky, mega dropdowns variations, fully customizable. You can place any content in dropdowns: links, text, images, widgets and shortcodes. 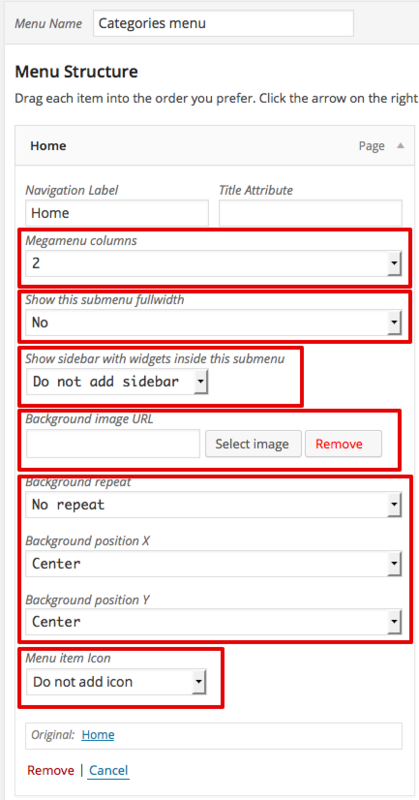 You need to activate MegaMenu features in Appearance > Theme Control Panel > MegaMenu > Enable Mega Menu. If you imported demo data you can setup Mega Menu Layouts for demo data menu items, because it does not have this settings by default after import. You can create more sidebars for Mega Menu in Appearance > Theme Control Panel > Mega Menu. 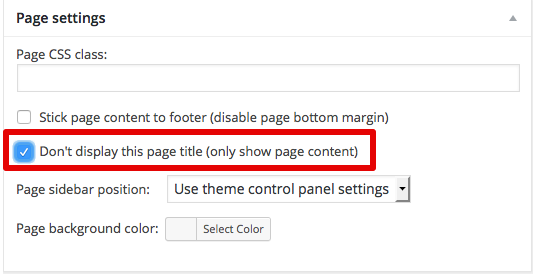 You can configure sidebar position (or disable it) for pages and posts independently in every page/post settings or apply global settings in Appearance > Theme Control Panel > Sidebars. Move widgets from left "Available Widgets" block to right sidebar that you want to use to add it to display in theme. Move widgets from right sidebars block to left "Available Widgets" block to remove it from display in theme. Our theme have special widgets that you can use in additional to default WordPress widgets. Change # to your real links, change texts and icons (instead of fa-file-pdf-o you can use another icons codes fromFont Awesome website). You can copy this code to add more different files links to your widget and you can use this HTML code on your site pages too (use Raw HTML element in Visual Composer to add custom HTML to pages content). 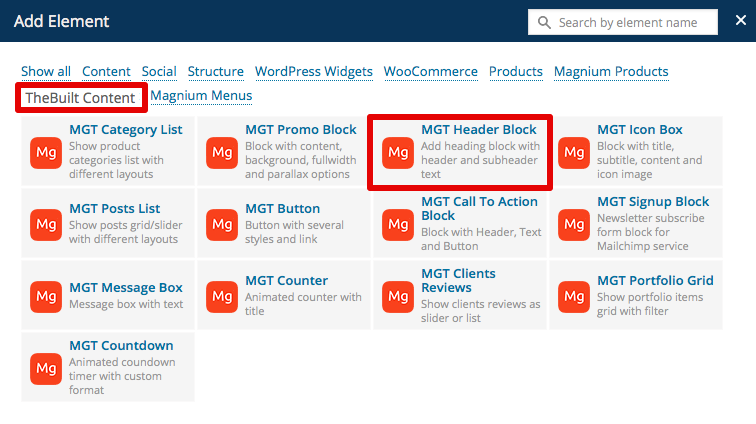 You can use some elements that you used in Visual Page Builder in page content in your widgets, for example MGT Promo Block. 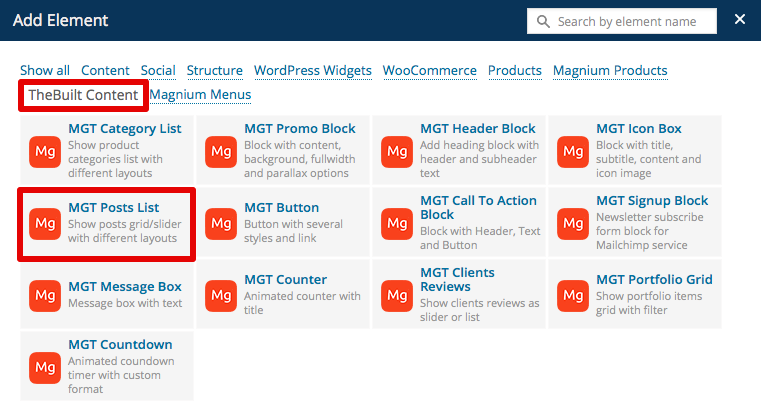 To use this widget add default WordPress Text Widget to your sidebar and add your Promo Block HTML code to it. 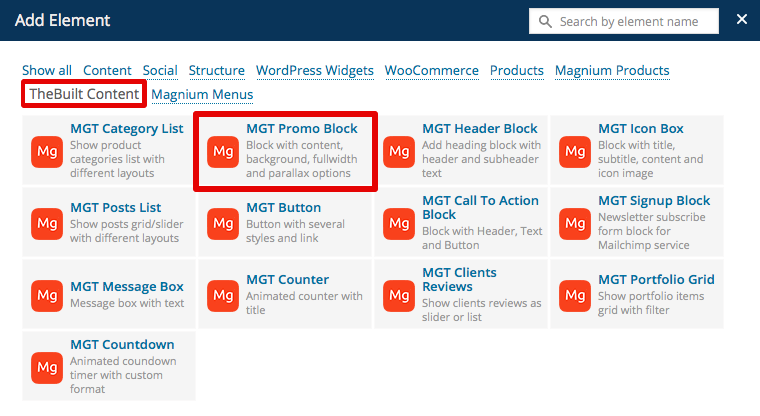 To get Promo Block element HTML code first create some sample Page and add MGT Promo Block using Visual Composer. Adjust block settings as you want. Then change Page editor mode to Classic view (this will disable Page Builder) and switch content editor to Text mode. You will see Promo Block HTML code, copy it and paste to your text widget. You can add nicely styled custom menus to widget sidebars. For example you can use this menu to show it on your services pages to have access to all other services list. You can use special theme widget to show recent posts with images. Use "TheBuilt Recent posts" widget to achive this. Our theme include special Widget Logic plugin that allow you to specify pages where your widgets will be visible or not. If you want to use this feature this plugin must be installed and activated. Add some widget to one of your sidebars. Usually you just need to use is_page() condition - this allow you to specify pages ID or pages names where this widget will be visible (all OTHER pages will not display this widget). We used this to show Services menu only on services pages. This condition means that widget will be visible only on pages with ID's - 769, 773, 626, 767, 771, 775. This condition means that widget will be visible only on pages with titles "Design", "Interior" and "Gardening". Be careful when you use your conditions, if you add something incorrectly you will get fatal PHP errors on your site (in this case restore our sample code in widget and try again). 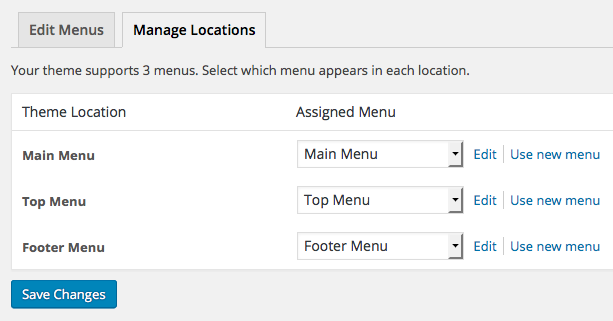 You can manage multiple theme settings in our Theme Control Panel module. Go to Appearance > Theme Control Panel from left menu in WP admin panel. Click Save button first time to apply default theme settings to theme. You can manage a lot of theme options from this panel, check all available Tabs with settings. If you want to reset settings to default values you can click Reset button at the top right. If you want to Preview site after some changes you can use Toggle Preview button to display/hide your site frontend without leaving admin panel. After you made any changes you should click Save button to save theme settings. 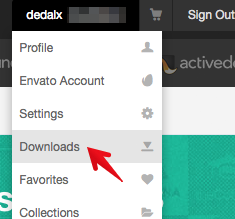 You can Export all saved settings to file, use Export tab for this feature. You can Import your saved settings file or data in Import tab. Our theme allow you to use transparent header on any page, post or portfolio element separately. This mean that all header (logo, menus, etc) will be displayed above your top page content with transparent background. This is very useful for pages where you have fullwidth Revolution slider or fullwidth Image/Block at the page top and you disabled page title. You can check live demo for this feature here. First of all upload your light (white) logo version for transparent header according logo upload instructions from this guide. Open your Page/Post/Portfolio page when you want to show transparent header (for example your homepage). Make sure that your page starting from fullwidth row with fullwidth slider, fullwidth image or fullwidth block with image (so your transparent header will look nice on this page top). 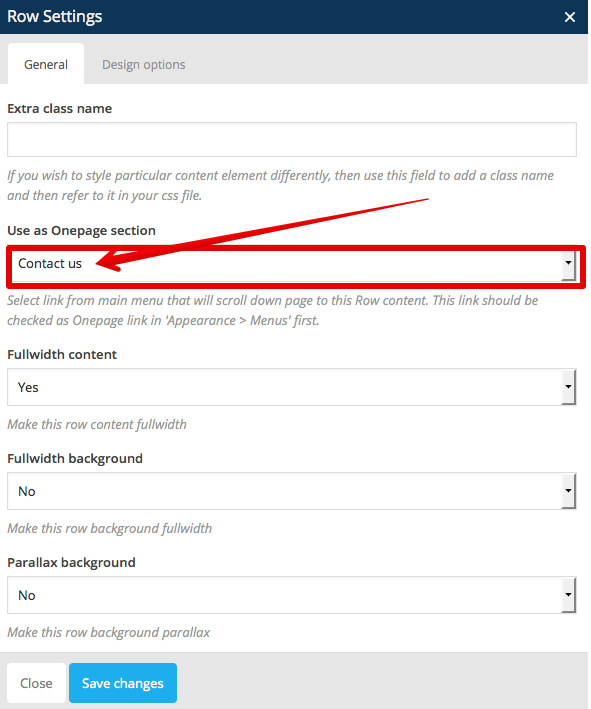 Read this documentaiton section how to use fullwidth rows in Page Builder. Save your page, post or portfolio element. You can use transparent header with or without Sticky Header feature that you can enable/disable in Appearance > Theme Control Panel > Header. Our theme allow you to have Onepage website instead of multipage. This mean that all your main content will be displayed on the same one Homepage and menu links will scroll your page to different sections of your homepage content. This allow your visitors to see all your website on the same page and easy and fast navigate between site sections without leaving your homepage and without page refresh/reloading. You can check onepage site demo here. MegaMenu feature should be enabled in Appearance > Theme Control Panel > Mega Menu. 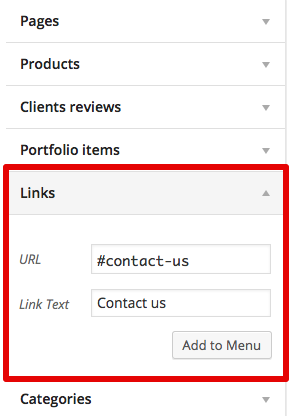 You need to add your item slug to URL field with # symbol at start (this is important! ), you can specify anything here, but you should use only english latters here and - or _ symbols. Do not use space symbol here or another languages letters or specsymbols. Add link title to Link Text (this link name will be visible in menu). 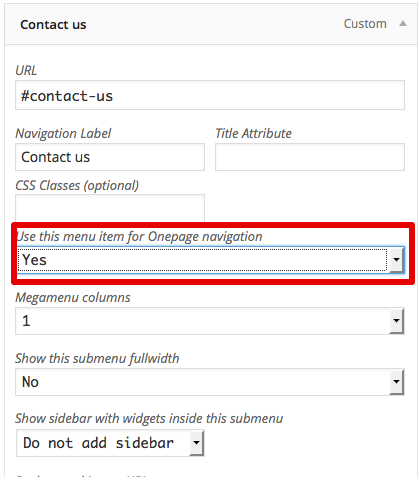 Select YES for Use this menu item for Onepage navigation option. Now you can add section for your homepage that will use this menu item. 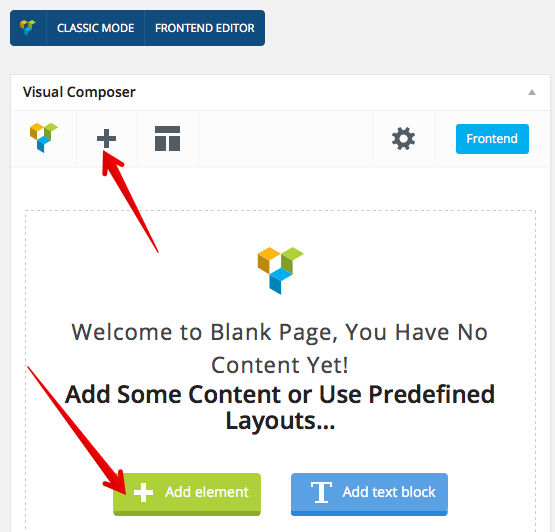 Using Page Builder add content to your page that you need to see on your homepage. You should create all content sections on the same page. In our example we added Contact us link before and want to point it to Contact us form on our Onepage Homepage. Now when you click your Contact us link in menu your homepage will be scrolled to your Contact us section. In the same way you need to create links and sections for all your Onepage logical sections. You can combine regular links (that open pages) and OnePage links (that scroll down homepage to section) in the same menu and have Onepage+Multipage website together on one site. In our theme you can choose between 14 portfolio grid layout variations, fullwidth or boxed layouts, spaced or regular grid, 8 portfolio item hover animations, 18 category filter animations, 3 column count settings and more! Our theme have built-in portfolio feature that allow you to add your works/projects on site and showcase it to your users. Go to Pages > Add new and create Portfolio page (You can use any name for page). You can select many different options and layouts for your portfolio grid display in element settings. If you want to show your Portfolio displayed Fullwidth you need to enable Fullwidth option in your Row settings. Go to Portfolio items > Add new item. Add your Porftolio element description using page builder (you can use any elements here) in Content editor area. If you does not see this settings box this means you does not installed all theme required plugins (TheBuilt Theme Addons, TheBuilt Custom Meta Boxes (CMB2) plugins). 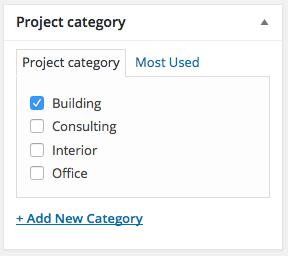 Short description field text will be visible in MGT Portfolio Grid as additional text after item title and category. It will not be visible on single portfolio element page. Our theme included 13 special Page Builder elements that we developed especially for this theme (this elements does not available in Page Builder plugin in other themes). You can use any default Page Builder elements with our theme too, about it usage you can read in official page builder documentation. Our theme allow you to create Page Builder rows with fullwidth display for background or content and add parallax image/video background to this rows. You can check live demo for this feature here. You can add any content (for example any other Page Builder elements) inside this fullwidth rows and this elements will be displayed fullwidth too. Open your Page/Post/Portfolio item and turn on Backend/Frontend Visual Page builder editor. Add new Row or edit existing. 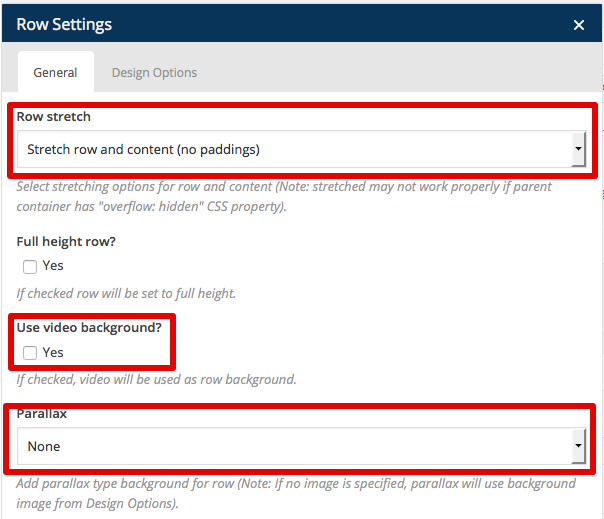 Row stretch - Select how you want to stretch content/background in this row to make it fullwidth. You can stretch only background or background with content (with/without paddings). Parallax - You can add Parallax background for current Row (we recommend you to use 1600px or more width image for this). You can add parallax effects to different page elements on mouse scroll. This feature is experemental and may not work correctly for some blocks and can work differently in different browsers. We recommend to use our theme demo page with this effect as start and change our images to your images, because you need to curefully adjust this effect settings and your images positions and sizes to get this effect working smoothly and without problems and elements overlays. Add parallax-it-row class name to Row class that contain elements that should get parallax effect on mouse scroll. Add parallax-it-slow class name to Element class. You need to adjust elements positions, speed classes, margins and padding for rows/columns to get this effect working in nice way. 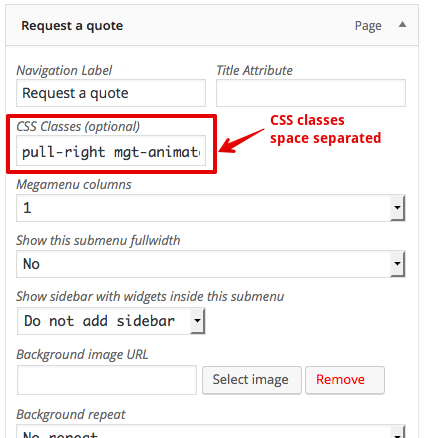 You can add special preformated header blocks with title and subtitle for your page. Add Title, Subtitle and select text Align for this block. You can add special promo blocks with optional background image, hover effects, parallax effects buttons and much more. This blocks can be any size and very useful to create attractive interactive banners on your website. This is very powerfull theme element that allow you to create a lot of creative things and can be used in most of all of your website. Most of all our theme demo homepages created just with promo blocks with different settings, check theme demo pages to understand how we configured this blocks. Read options descriptions in Settings window to understand how to use it. You can customize a lot of different options in this block and even show it fullwidth (inside fullwidth row). 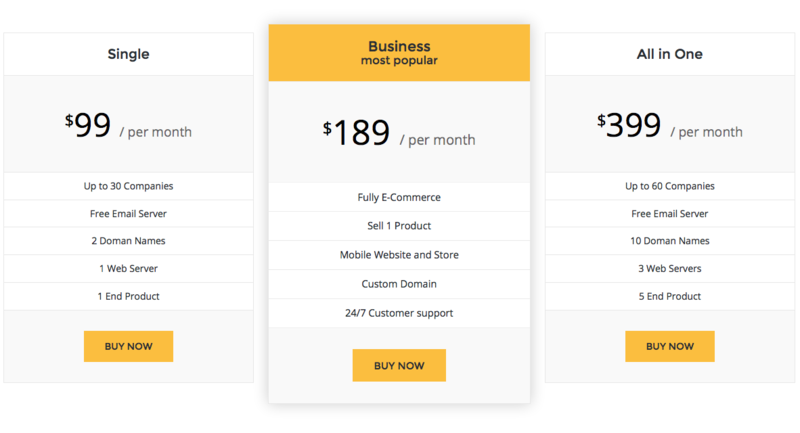 You can add multiple pricing tables to your site, with different styles, colors, borders, icons, etc. Add new Row with several columns (for example if you want to have 3 pricing tables in one row you need to add Row with 3 Columns inside. Read options descriptions in Settings window to understand how to use it. You can customize a lot of different options in this pricing table. Add / Dublicate more pricing tables to other columns. 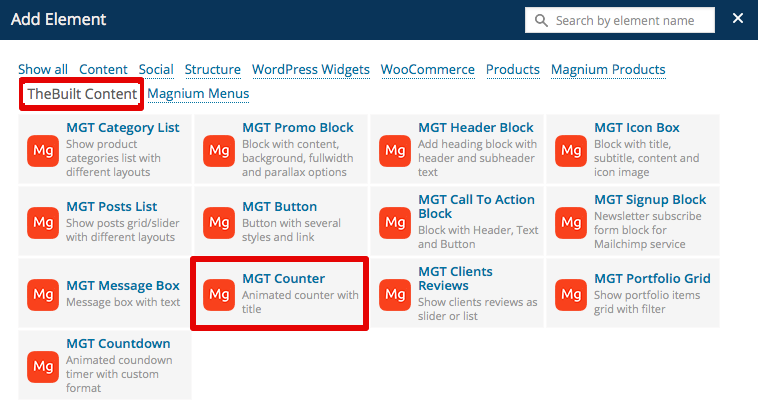 You can add special preformated blocks with icons to your content. Read options descriptions in Settings window to understand how to use it. Add your information to this block, upload your icon, select layout. 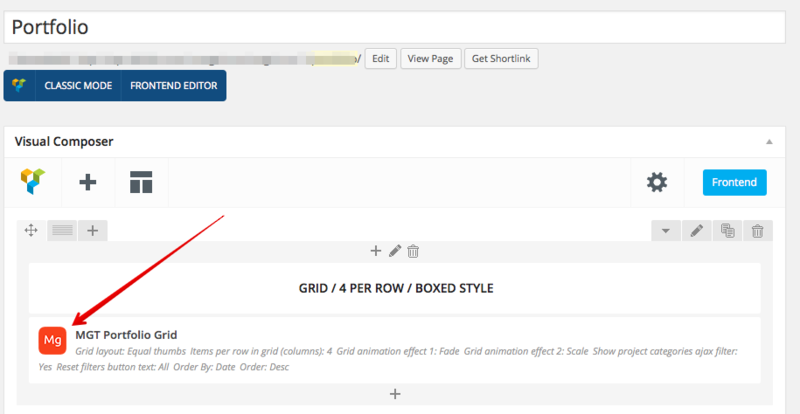 You can show your blog posts as sliders or grids. Read options descriptions in Settings window to understand how to use it. You can select different layouts, slider options, grid display and more. 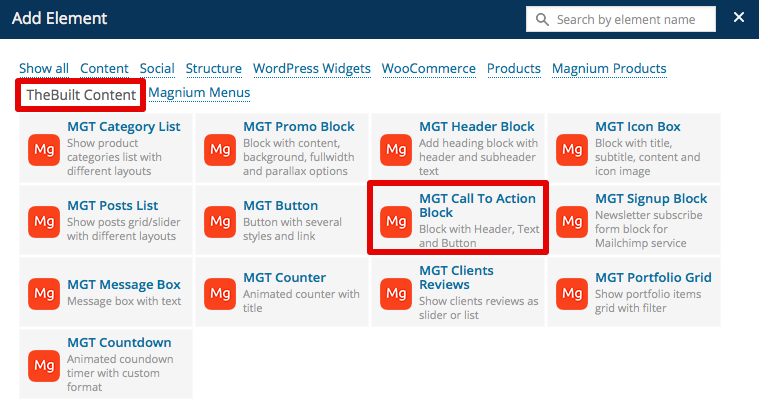 You can attract your website visitors with special Call to Action blocks with button. Add your title, subtitle, text and button with url. You can add signup block that allow your users to subscribe to your Newsletter by email via Mailchimp service. Select Text color, Background color, Signup text, Button text. Login to your account at Mailchimp service. Around your subscribers list click little arrow button and select Signup forms. You will see your subscribe form HTML code, copy it and paste to some text editor (for example to Notepad or TextEdit. 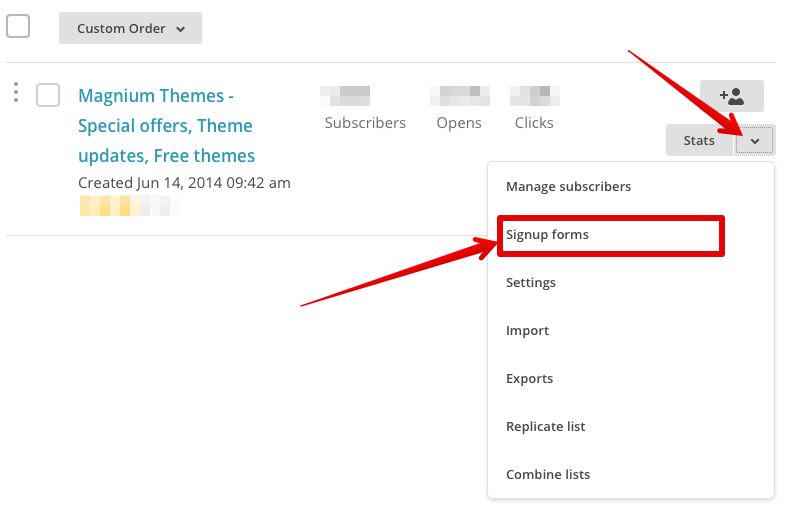 Add your subscribe form action url to Mailchimp subscribe form ACTION url field. 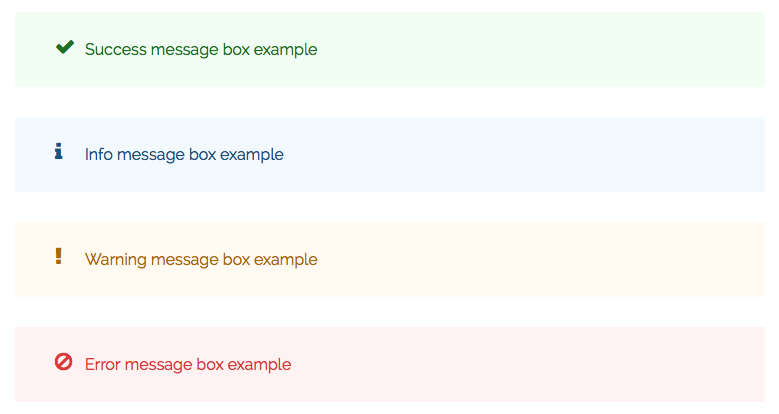 You can show different message boxes on your website to announce something important. Add message box text, choose style. 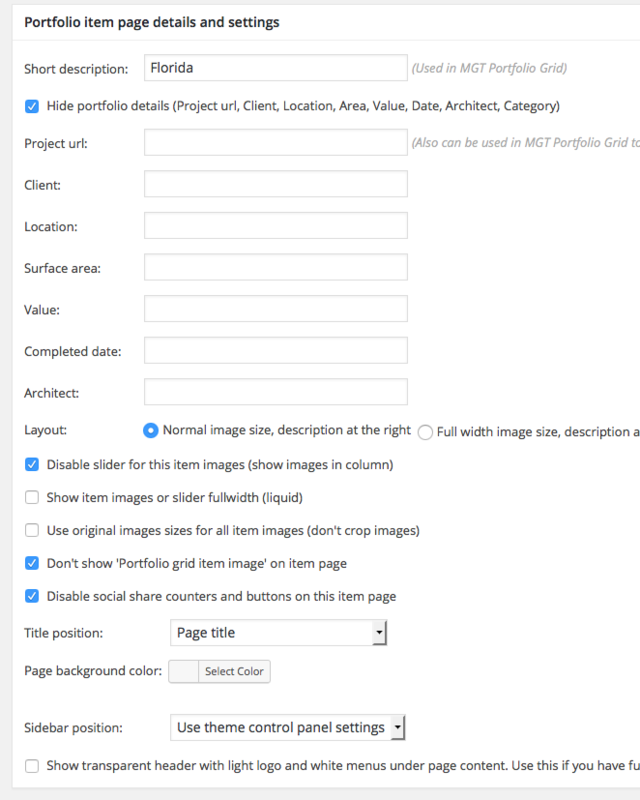 You can show your portfolio items with category filter in different grids with different layouts on any of your pages. You can check live demo for this feature here (Use Portfolio menu at the top to check different demos). Read options descriptions in Settings window to understand how to use it. You can choose different layouts and options for this element. You can show this element inside fullwidth row. 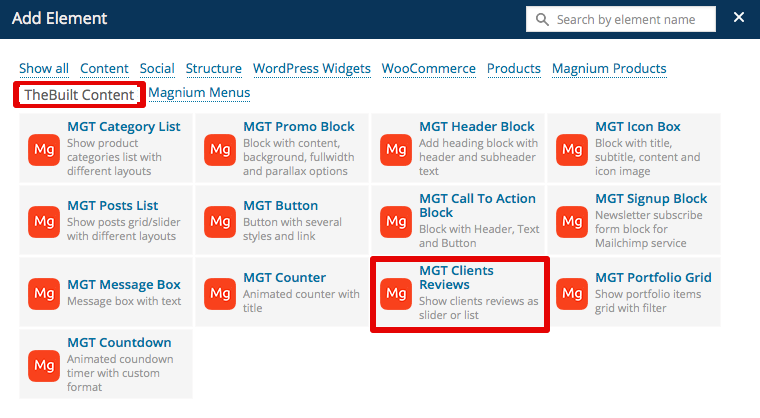 You can add and show your Client Reviews as slider or grid on your website. Read options descriptions in Settings window to understand how to use it. You can choose different layouts and options for this element. You can show your completed goals or achievements with special animated counters that will count from 0 to your value when user scroll page to this element. Read options descriptions in Settings window to understand how to use it. You can choose different options for this element. You can show countdown timer in different formats to show remaining timer for selected date. You can add different buttons to your website. This theme is translation ready and WPML plugin compatible and this mean you can easy adapt it to your language or use it multilanguage. You can translate theme manualy of using Translation plugin that we included with theme. 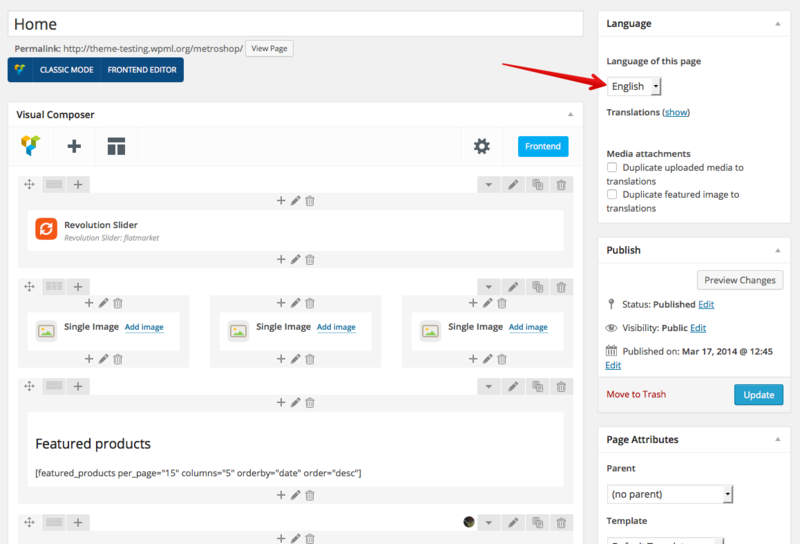 Read this section on Wordpress website about WP translations. Here is what you need to know on turning our theme multilingual with WPML. First, you need to to purchase a recent version of WPML, including the String Translation and Translation Management modules. You can install WPML plugins automaticaly from Hind Theme Control Panel > Multilingual (WPML) tab. Please not that you need to purchase 1 additional Regular theme license for our theme for every language on your site. For example if you have your site versions in English, German and Italian languages you need to purchase 2 additional regular Hind theme licenses (in addition to current one that you have for English). - Install and activate the core WPML plugins (WPML Multilingual CMS, WPML String Translation, WPML Translation Management), and then other WPML plugins that may depend on them. - Set up WPML from WPML > Languages. See WPML Getting Started Guide for complete reference, but the initial simple three-step setup is self-explanatory, asking you to choose your default language, a set of active languages, and a language selector. To translate a page you need to go to WordPress admin panel > Pages and in the list you will see columns for each active language, with a pencil icon (for ‘edit translation’) or a ‘+’ icon (for ‘add translation’) next to each page. Go ahead and edit or add the translated page for your Homepage. Our theme and some plugins can have extra custom post types, and custom taxonomies. In order to get a similar interface for translation/duplication as for posts and pages, you need to go to WPML > Translation Management, and select the tab ‘Multilingual Content Setup’. From WordPress Appearance > Menus you can see your existing menus and add menu translations and synchronize menus across translations. To use Multi Currency on your website you need to install WooCommerce Multilingual plugin for WPML. To show the language and currency switchers in the header you need to configure it in WPML and then activate it from Magnium Control Panel > Header. To translate strings you need to follow the procedure for Theme and Plugin Localization. Go to WPML > Theme and Plugin Localization, and click on ‘Scan the theme for strings’ and you will see theme strings and which ones are translated or not. You can use our theme as Child theme. Check our special article how to do this. Our theme created for very fast and effective work, with correct server configuration and content optimization you can get 85-90 / 100 score in Google PageSpeed Insights test. Site speed depends on several things in addition to theme (that already coded for extra fast work), like WordPress configuration, Server configuration and quality and Content optimization. We included simple guide how to optimize your website for extra fast work with our theme. Order Premium WordPress Website Google Page Speed and SEO Optimization service on Envato Studio. You need to read this plugins documentation how to use this plugins and how to configure plugins correctly. You will see when theme update available on our website, our social profiles and in email from Themeforest (if you subscribed for theme updates notifications). Do not update plugins bundled with theme yourself (even WooCommerce), before we will not add this updated plugins to our theme and tested it compatibility. We offer theme support and updates for our items. If you need customization service or WP/Theme setup check our customization services page. Please dont ask support questions in themeforest comments, email, skype, facebook or twitter - questions in this places will never be answered.